In Malaysia, one of the most common habits among youths is staying up late at night and then goes out seeking for food in the middle of the night. Luckily here, we can find food 24 hours a day. When we mention supper or commonly known as “yum cha”, the first thing to struck our mind is mamak! Mamak is an Indian-Muslim community in Malaysia who are famous for its fast and good food, available 24 hours a day. It’s in a way our own version of fast food. Mamak is like grown mushrooms after the rain in Malaysia. You can simply find one nearby whenever you need it. There are all sorts of choices ranging from breads to noodles to soups to rice with various spicy dishes. Definitely a place for food indulgence. When I first came up to KL to stay, I lived in Wangsa Maju. Many foodies should know that it’s a heaven for food. Right smacked in front of my condominium is the infamous mamak, BRJ. There they serve truly delicious and sinful Nasi Lemak. More on that next time if I ever have the chance to go back for my true Nasi Lemak. But the sad thing is they don’t serve one of my favourite Indian cuisines, which is chapatti. Chapatti is an Indian flatbread made from atta flour(South Asian whole grain durum wheat flour). Everytime I go to mamak, if I’m hungry (I never have this habit anymore to eat late at night), I would order chapatti. It is one of my favorite healthier options for a midnight snack. Chapatti is usually served with dhal, another favourite curry accompaniment of mine. But now, lucky me, I have a nearby mamak which serves chapatti with thick and rich dhal. I would keep on ordering refill for the dhal. Nowadays, the “yum cha” session had toned down considerably, and even if we do go out, I seldom eat. Therefore, it has been quite some time since I have my chapatti fix. The only solution I can think of is to make my own! 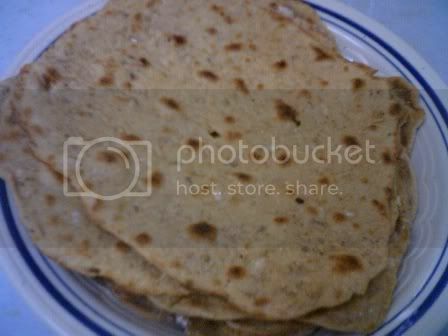 I came across this recipe from Zu’s Blog, to make simple and easy chapatti. The part I find most troublesome is the rolling out. I had quite a trouble because it kept on sticking to the table and to my rolling pin. Lessons I learn is, to use more flours to knead it after resting and then use hand to first flatten it. Our hands are the best tool to feel the right texture needed for the bread. After that, use the rolling pin to flatten it further. Each time turning it 90 degrees and flatten again, to achieve a better rounded shape. Careful not to roll to thin or you’ll end up with crispy biscuit like bread instead. One more thing is, I had replaced recipes ½ cup plain flour to make it all atta flour, and regretted it. The chapatti was slightly on the tough texture, and later I learnt that the plain flour is to make it softer. Next time I would stick to the right flour ratio. To coarsely grind the spices, I had used my good ol’ pestle and mortar, courtesy from my dear nanny. 6. Place rolled dough onto non-stick pan and cook till bubble forms. Turn over and cook.